The last time such a prominent group of black athletes came together surrounding a social issue was nearly 50 years ago. That is, up until last week. 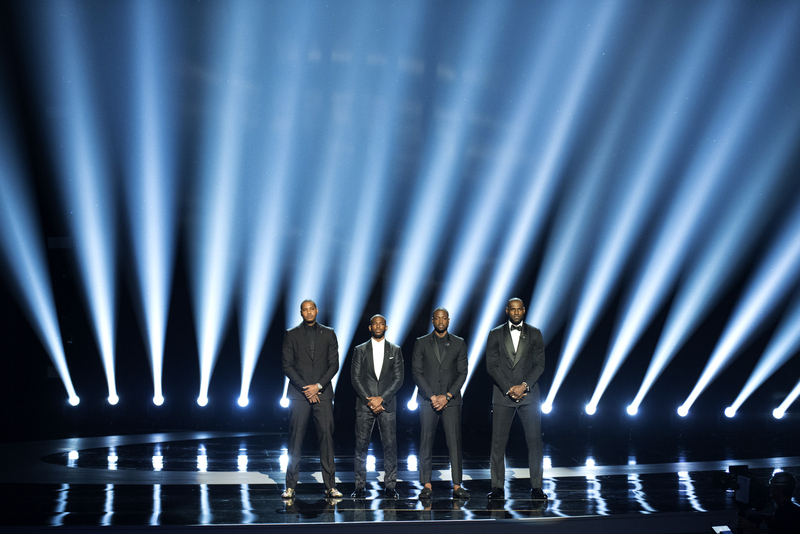 Four of the most well-known and powerful black NBA players: Carmelo Anthony, Chris Paul, Dwyane Wade and LeBron James – stood shoulder to shoulder in brotherhood and started the 2016 ESPYS with a somber and collective plea to end violence, end aggressive racism against blacks and asked other athletes to use their own platforms to speak out and act. This wasn’t a programming request from the ESPYS producers, it was an inspired gesture initiated by the friendship and intention of the foursome. There now seems to be a struggle in figuring out what to do next for this new group of black athlete activists. The answer is simple: Listen. There is surely something to learn from the “Ali Summit” group of June 4, 1967. Three prominent athletes, Jim Brown, Bill Russell, Kareem Abdul-Jabbar (then Lew Alcindor), with everything to lose, sat beside boxer Muhammad Ali in unity as he refused to fight in the Vietnam War. Ali had asked this group to stand with him and took it upon himself to self-educate and be a leader in speaking out at that time. What made this gathering of such prominent black athletes during the prime of their careers so powerful was that they were risking their careers and freedoms in speaking up for a civil rights issue. Ali was convicted of draft evasion, sentenced to five years in prison, fined $10,000 and banned from boxing. He appealed his conviction, eventually going to the U.S. Supreme Court, where it was overturned 8-0 in 1971. Ali lost three years of his career and who knows how much in money. None of that would ever happen today. Systemic racial issues today are similar to 50 years ago. However, the circumstances couldn’t be more different for black athletes. Black athletes’ power today in both social and financial capital has drastically changed and there is no longer anything to lose by using their platforms to raise awareness and push for change around social issues. On July 13, some of the world’s premier athletes and biggest stars joined host John Cena on stage for The 2016 ESPYS Presented by Capital One. The 24th annual celebration of the best moments from the year in sports were televised live from the Microsoft Theater on July 13. Athlete activists should be reaching out to Brown, Kareem Abdul-Jabbar and Bill Russell to hear what they have to say. Initiating conversations and listening to a diverse group of citizens who live and do work in the communities in different parts of the country will get Carmelo, Dwyane, Chris and LeBron closer to what their specific call-to-action should be. Call on someone like Georgia U.S. Rep. John Lewis — a career civil rights activist and community organizer — who marched in Selma, Alabama, in 1965 with Martin Luther King Jr. for black voting rights. Today, at the age of 76, representing Georgia’s 5th District since 1981, Lewis has been one of the most respected members of Congress. He has called for health care reform, measures to fight poverty and improvements in education. Not only does he know the history of how to create change in the United States, he is the history that is being taught in today’s schools. Reach out to Officer R.J., the 36-year old black Los Angeles Police Department officer who grew up in South Central L.A. and used basketball to stay out of trouble when he was younger. R.J. lost most of his childhood friends to gang violence. Hear why he joined the LAPD, and the stories about the discrimination he faces from the black community in LA for being a police officer. Despite the hard times, he is optimistic that police and community understanding will continue to improve through new programs such as the LAPD’s Community Relationship Division and its Community Safety Partnership Program that uses youth football and has come close to all but eliminating homicides in some of the city’s housing projects in just three years. Engage DeRay McKesson, a 31-year old black man born in Baltimore who worked for Teach for America in New York City after graduating with degrees in government and legal studies and went on to work in the Harlem and Minneapolis school districts. He moved to St. Louis after months of spending time there after Michael Brown’s death and protests in Ferguson, Missouri. In August 2015, McKesson and a few other young fellow activists created Campaign Zero, a plan that consists of 10 proposals, all of which are aimed at reducing police violence, and uses the reports to help influence politicians in policy making. McKesson has become a strong voice in current social activism and organization, frequently appearing on national media and penning inspiring op-ed pieces. Hear what Oliver Thomas, a former city council member and now radio host in New Orleans, has to say. At 59, he continues to be a community leader and talks frequently about the climate being worse for the black community now than it was pre-Hurricane Katrina. Mr. Thomas grew up in the lower 9th Ward and played basketball to stay out of trouble. He sees that black leadership is needed in New Orleans and Baton Rouge, Louisiana, particularly black male leadership. He thinks that professional black athletes who are from and play in that region are the perfect fit to bring the community together and inspire others to step up. Despite some light criticism, Thomas is supportive of Mayor Landrieu’s NOLA for Life program, which uses 35 different initiatives to prevent crime and homicide in the region, including a Midnight Basketball League. Athletes should not expect to make social change on their own, or know the answers on their own. They need to continually bring together and engage a community of experts and advocates in the field to understand what would effectively sustain the change we all know is needed. There is now a strength in black athletes to call on and mobilize large, diverse portions of the population that has never existed in the past from community organizers, politicians, media, sponsors and other athletes – both black and white. Their leadership and platform can be the catalyst for change. The exact call-to-action might not be known just yet, but black athletes are the most powerful force to bring people together to figure that out. Erit Yellen is a producer and writer for documentary films on sports and social issues. She has worked in the sports media industry with pro athletes, humanitarian organizations and social justice initiatives. She's also an adjunct professor at USC's Annenberg School of Communication in Los Angeles.